So what else did she have to say? Let’s have a look at this again. What people are seeing and instinctively recognizing is a change in the average conditions. They are seeing very unusual things happen — birds here that you didn’t used to see, red fire ants here that we didn’t used to have, trees and plants are flowering earlier in the year, our weather is becoming much more extreme, where it’s either feast or famine. I’ve been here for five years and in five years we’ve had the longest dry period on record, we’ve had the record drought that we’re in right now, and we’ve had two 100-year rain events. Long periods without rain are, of course, extremely common in Texas, and particularly so in the area of West Texas around Lubbock that Katharine is referring to, which is categorised as “dry semi-arid” under the Koppen Climate Classification. The dry spell Katharine talks about was in 2005/6, but we need to take a long term perspective on this to see what significance, if any, there is to be drawn. This analysis shows quite clearly that the last decade has been absolutely normal and that there have been three decades previously when dry spells were more frequent. But was the dry spell in 2005/6 significantly longer than usual? In Crosbyton this particular dry period lasted for 56 days. The same USHCN records in Crosbyton show that over the last 100 years there have been 28 occasions when dry spells of over 50 days occurred, in other words about once every 4 years. So I guess Katharine’s “once in 5 years” is par for the course! The longest dry spell over this period for Crosbyton was 88 days from October 1921 – January 1922. Perhaps the period from October 1970 – February 1971 was even worse as 112 days passed with just 0.02” of rain in the December. I have difficulty in understanding why an intelligent and professional scientist such as Katharine cannot see these sort of things from a long term perspective. Is that not her job? N.B. For anyone interested the dry months are listed below. ← Katharine And The 100 Year Rain Events. Good quote from Oppenheimer. Bad source for openness. His connections with the Soviets cause him to lose his security clearance. And he was not open about this problem. If she has tenure, she can say anything without fear of getting fired. Tenure destroys a lot of once-good minds. Your region will likely continue to be dry for as long as we have La Nina conditions in the Pacific. Drought conditions in Texas and the Southeastern US are a normal response to La Nina and we appear to now be having two of these conditions back-to-back. 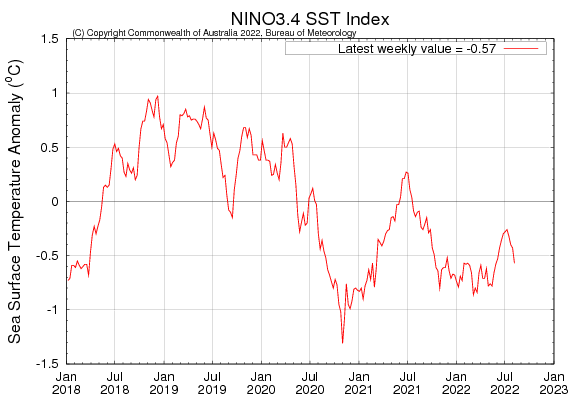 In fact, this is the third La Nina since 2007-2008. So if the Pacific Decadal Oscillation is, in fact, swinging negative and we have more La Nina years than El Nino, expect more dry spells in Texas. When it is below 0, you have a better chance of dry conditions. Of course it is all ultimately up to the wind and circulation patters but when the “NINO3.4 SST” index is negative, Texas stands a better than average chance of dry weather. So … considering the forecast for the coming year is for continued “negative” readings, it looks like Texas is in for another dry winter/spring/summer at this point. I took interest in reading the story (and searching for more about her) just because of her outspoken Christian view that is connected to her CAGW belief. Just looking at her research history, she is a modeler, so that would explain why she is completely wrong about the droughts !! How do you think the MSM would portray her IF any person from Texas used his / her religious beliefs in science????????? The bloodletting would be ferocious !! No, her job is promoting CAGW !! !